The Bachelor of Architecture (B.Arch.) is an undergraduate academic degree designed to satisfy the academic component of professional accreditation bodies, to be followed by a period of practical training, prior to professional examination and registration. It is awarded for a course of study that lasts up to five years. In India, it is accredited and approved by the Council of Architecture, New Delhi. The Council of Architecture (COA) (http://www.coa.gov.in/) has been constituted by the Government of India under the provisions of the Architects Act, 1972, enacted by the Parliament of India, which came into force on 1st September, 1972. The Act provides for registration of Architects, standards of education, recognized qualifications and standards of practice to be complied with by the practising architects. The Council of Architecture is charged with the responsibility to regulate the education and practise of the profession throughout India, besides maintaining the register of architects. For this purpose, the Government of India has framed Rules and the Council of Architecture has framed Regulations as provided for in the Architects Act, with the approval of the Government of India. What B.Arch. 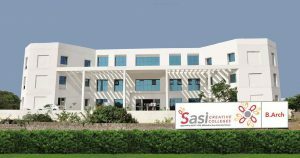 is offered by Sasi Creative School of Architecture (SCSA), Coimbatore? The B.Arch. (Bachelor of Architecture) offered by Sasi Creative School of Architecture is approved by COA, New Delhi and affiliated to Anna University, Chennai. It has an unique value added program known as iLeadership, which is a premium one in the sense that it envisages your Creativity skills, Employability skills and a right platform to begin a rewarding career in the field of Architecture. The SCSA’s B.Arch. is basically practice oriented learning and it assumes greater significance in the context of positioning an aspirant in a creative role. Our Motive is to develop the young budding architects of today into the Creative Architects of tomorrow. Can I find a job after the completion of B.Arch.? There are plenty of job opportunities available in the field of Architecture, you can also start your own practice. As a matter of fact, our faculty will guide you in finding the right job which matches your potential. They will make you an industry ready person by their academic deliverance and activity based teaching. You have to make best use of these classes and training to get a better job opening. What is the duration of B.Arch.? The duration of the B.Arch. is 5 years spread over 10 semesters as per Anna University (Chennai) rules. The minimum eligibility is 10 + 2 for students of PCM discipline (or) Diploma in Architecture (or) Diploma in Civil Engineering (minimum 3 years) with a minimum pass score of 50% and a minimum NATA test score of 40%. Can you explain the Eligibility, Admission Process and the selection process? Candidates for admission to the Programme leading to the degree of Bachelor of Architecture (B.Arch.) shall be required to have passed 10+2 examinations of any recognized Institution or authority accepted by Anna University, as equivalent thereto, subject to amendments as made by the Anna University from time to time. The candidates shall also be required to satisfy all other conditions of admission thereto prescribed by the Anna University, Chennai. A merit list will be prepared and then the candidates will be called for group discussions and personal interviews. Based on their performance, the selection will be made. Can I avail Bank Loan? How will you support me in this regard? What is the procedure? Yes, you can avail a bank loan from any nationalised banks. The assurance will not be given by the college, but documents pertaining to the Education loan such as Admission letter, Bonafide letter, Affiliation letters & Fee Structure duly signed by Principal/Director – Finance, will be provided. The same documents will also be provided in the case of on-line Edu loan application filling. Banks offer educational loans as they feel that students pursuing a B.Arch. degree will have the earning power to pay back the loans, especially if you graduate from a reputed institution. These loans are quite easy to get, as they do not require any guarantee. But what makes bank loans such a desirable option is that you don’t have to repay the loan until you start working, which should not be difficult once you earn a good salary after graduating from an approved college. Can you briefly describe the Program structure? Our B.Arch. program is uniquely designed to foster creative thinking and produce innovative ideas in Architecture. Our curriculum offers a B.Arch. degree from Anna University, Chennai and an unique value added certificate program called the iLeadership program. Can you throw some light on your iStudio Program? A twinning program is a short term exchange program between two partner institutions for mutual benefit by collaboration to facilitate and enhance the creative design experience and provide global exposure to students and teachers. The iSTUDiO twinning program is an unique and innovative effort to combine real time creative skills in the design studio with hands-on workshop exercises. The iSTUDiO comprises design teams in mixed groups of four students from both the partner institutions working to prepare a holistic design scheme within a predetermined time frame. The iSTUDiO also facilitates on-site learning by visits to architectural projects of international repute and local heritage sites in order to draw inspiration and facilitate learning of design approach and style, materials and construction technologies, and state of the art building systems. The iStudio program is an unique value added certificate program given to students to help them nurture their creative thinking and produce innovative ideas in Architecture. This program consists of fundamental classes on creative thinking and innovation. The creative thinking class challenges the students with presentations and debates on varied topics and subjects, helping them think outside the box by examining issues from various perspectives. The innovation class in junction with the creative thinking class applies their creativity in Architecture to produce new ideas for products and services. These classes are evaluated solely on presentations and it helps develop various essential skills such as intuitiveness, collaboration, technical know-how, personality development, public speaking, and leadership. This program also encompasses Mind mapping, Research & Development cells, Zero Carbon Project and Centre for Innovation Development. Do you have Hostel & Transport Facility? A safe and secure environment is provided for the students at the Boys/Girls hostel. The high standard of hygiene maintained in both the food preparation and housekeeping, ensures that the students feel at home. We provide Transport facilities, connecting the college to various important points in the city. When should I remit the fee? Can I pay in installments? You have to pay your full year fees before every academic year. For financially poor students, prior permission for semesterly remittance should be obtained from the management (subject to their approval). Those Students who have applied for bank loan will get the DD once in a year. If the bank loan is getting delayed, the students have to pay the fee by the stipulated date by making some alternate arrangements. Do you have Mess/Canteen facility? Yes, we offer subsidised food, which has been prepared hygienically. Do you come under NATA? Yes, we are a certified NATA test centre. Our code is TN46. Do you provide Training and Placements? We will shape you and we will make you an industry ready person. We will lead you to the threshold and the rest is your performance and caliber. Special attention will be paid, to improving your communication skills and other grooming factors. We have also signed an MOU with Triple O Studio, a design firm based in Chennai and Coimbatore, to facilitate an industry-academia interface and send our students to them for internships. Our students have also completed projects in Bangalore, Pondicherry and Pollachi. What is the required percentage of marks for admission? Students are accepted based purely on merit. Kindly refer to our admissions page for more details. You can also contact our admissions office. Not mandatory, work experience is not a requirement for admission. A little experience is however helpful, as it will enable you to contribute to classroom discussions and also apply your mind practically when writing exams. What is the teaching style of professors at SCSA? SCSA’s faculty employ a variety of teaching methods, including lectures, case studies, team projects, writings, problem sets, presentations, company visits, guest speakers, and other theoretical/practical and applied teaching methods. The teaching method used in a class is the choice of the individual professor and is chosen to best facilitate learning for that subject matter. We follow the procedures of COA & AU. Is there any part-time program? No, SCSA does not offer any part-time or spring-entry programs. Investing five years in a B.Arch. program, is it a good decision? Well, your question has the answer in it. B.Arch. is an investment, one that might not provide you immediate financial or career returns, but five years down the line when you walk through the mean streets armed with a B.Arch. degree, all the sweat will have been worth it. Finances should not stop you from applying for a B.Arch., financial aid is easily available from various sources. Normally we won’t give any scholarships, but scholarships are available from private corporations at the national level, as well as local charitable trusts and foundations. For example, the Aditya Birla Scholarship is offered to students who are performers. So you can approach them for facilitation. What are the extracurricular activities available? Sports, Cultural and various other fun & various social activities (including Forum for creativity in Social Reconstruction) inter collegiate events, are scheduled throughout the program. We offer a five-year exclusive and part-residential Bachelor of Architecture (B.Arch.) program approved by COA, New Delhi with a degree from Anna University, Chennai. Our B.Arch. is supported by a specially designed iLeadership program that will help architecture students to enhance their creative and innovative skills along with people leading and communication skills. Creative thinking abilities and innovative ideas in architecture change the life style of the people. The semester system allows the students to learn more subjects in a year and helps them to specialise in their area of interest. A seminar hall, audio/video class rooms, smart boards and other technology updates, ensures the highest level of ambience for learning within the class room. Knowledge is confidence. Our students pursue knowledge beyond boundaries with the aid of the latest digital library/wireless/internet technologies. Our campus is Wi-Fi enabled. Case studies, discussions, face to face feedback, role plays, simulations, team projects are part of a daily curriculum to help students identify, analyse and address the various Architecture based problems. Every week we will have eminent architects from diverse parts of the country to visit and interact with our students. We have learning labs and clubs to experience the breadth and depth of architectural skills. Small clusters always deepen the personal and professional relationships, making them last a life time. Students will be doing small team projects to develop their communication, problem solving and decision making skills. Our unique iLeadership certificate course along with B.Arch. transforms the students into influential architects. We have recreation and cultural clubs for the students to develop broad based thinking, based on real life situations. The skills and knowledge received from the range of experience provided to our students, will help them to outsmart the competition and provide the impetus for a better career.